1st. That if they believe from the evidence that the deed of Manumission made by Robt Armistead was in accordance with a purpose deliberately formed by him for a long time previous to his death, and repeated declared by him, when of sound mind and capable of managing his affairs, and knew what he was doing, when he executed, said Deed, They must find for the petitioner. 2d. That if the Jury believe from the evidence that Robt Armistead, at the time of executing said deed, was capable of understanding what he did when by executing the deed in question when its general import was explained to them that its import was explained to him or [illegible] by him. They must find for the petitioner. 3. 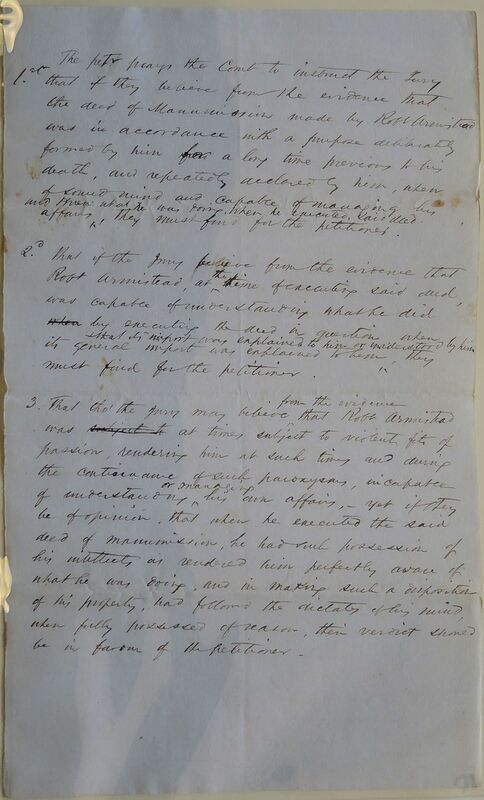 That tho' the jury may believe from the evidence that Robt Armistead was subject to at times subject to violent fits of passion, rendering him at such times and during the continuance of such paroxysms, incapable of understanding or managing his own affairs, yet if they be of opinion, that when he executed the said deed of manumission, he had such possession of his intellects as rendered him perfectly aware of what he was doing. and in making such a disposition of his property, had followed the dictates of his mind, when fully possessed of reason, then verdict should be in favor of the petitioner.